Celebrate the New Life Festival with the Khajiit of Rawl'kha. 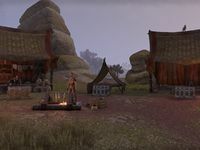 Breda, a New Life Herald in Eastmarch, spoke of Rawl'kha's New Life Festival in Reaper's March. Unlock the three nearby locked chests and take the coins inside before the time runs out. Return to Breda to complete the quest. Breda tells you of a Khajiit New Life tradition which involves trickery and sleight of hand. "Khajiit of Rawl'kha honor their trickster god Rajhin with the Trial of Five-Clawed Guile. Travel to Reaper's March and speak with Tumira. She'll help you celebrate the New Life with the slightest of hand!" All right, I'll head to Rawl'kha. Tumira can be found on the other side of a bridge from the wayshrine at Rawl'kha. "This one welcomes you to the Trial of Five-Clawed Guide! Celebrate the New Life and pay your respects to Rahjin, all at once!" "Rajhin once said, 'A rock is a pebble to be tossed from one's boot.' Use your lockpicks to retrieve the contents of the nearby chests. Show you have as little regard for barriers as the mighty Rajhin. And be quick about it!" You will need to unlock three chests of varying difficulty levels -- Simple, Intermediate, and Advanced -- and loot Rajhin's Coin, Prowler's Coin, and Footpad's Coin from within. You'll have a minute and five seconds to do it, starting when you interact with any chest and ending when you finish unlocking the last chest. If you want the Five-Clawed Cat Burglar achievement, you'll have to do it in just thirty-five seconds. If you've grouped up with other players, you can each work on different chests at the same time; your progress will be shared. If you fail the challenge, you'll need to return to Tumira. "A valiant attempt, but Rajhin frowns upon your beetle's pace. Well, this one frowns on behalf of Rajhin." "Of course! Rajhin often tricked the unwary by causing them to underestimate his prowess. This one suspects your 'failure' was a gambler's feint. Go! Prove yourself to all who doubt." Line breaks for failure? Once you complete the challenge successfully, return to Tumira. "Rajhin would applaud your swiftness! Though, he might instead pick the pocket of one distracted by your prowess. Truly, the best thieves come and go with the wind." What should I do with the coins? "What coins? You aren't the only one who honors Rajhin. As you brought them to me, another retrieved the coins from your pocket and returned them to the chests. Such is how Rawl'kha celebrates the New Life, finding true wealth in our actions." Upon returning to Breda, you'll find that this is a regular occurrence. "Ah, you return from a land of grass and sweetrolls to one of snow and mead! How was your visit to Rawl'kha?" I completed the Trial of Five-Clawed Guile. "What did Tumira ask you to do? Retrieve the coins from the chest, or from the victor's purse? No, don't tell me--I'll ask her when she visits." There is one achievement associated with this quest. She said I should travel to Rawl'kha and speak with Tumira. I should speak with Tumira, the Festival Chief of Rawl'kha.. I must retrieve the contents of three locked chests within a short amount of time. I will need lockpicks to open the chests. I retrieved a unique coin from each of the locked chests. I should present them to Tumira. This page was last modified on 18 December 2018, at 01:43.